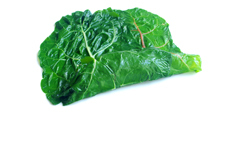 A relative of spinach and beets, Swiss chard offers fantastic antioxidant protection in the form of carotenoids, which help maintain eye health, boost immunity, and may even fight cancer. 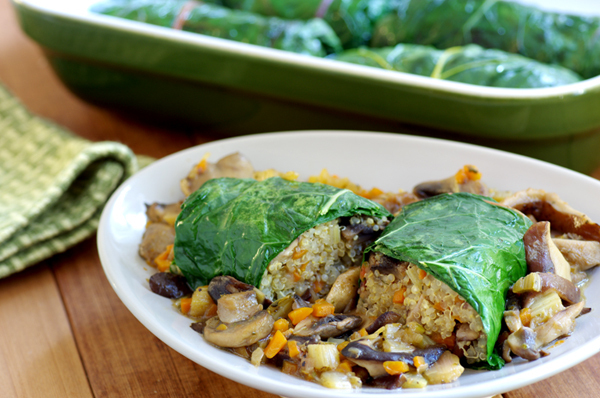 Here, chard leaves are rolled around a protein-rich quinoa-mushroom filling for an elegant entreé. 5 cups homemade or reduced-sodium store-bought chicken or vegetable broth. 1. Preheat oven to 350ºF. Prepare an ice-water bath. Bring a large pot of water to a boil. Blanch chard until tender and bright green, about 2 minutes. 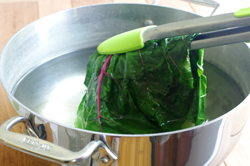 Using a slotted spoon or tongs, transfer chard to the ice bath, let cool, then transfer to paper towels and pat dry. Reserve leaves, being careful not to tear them. Cut off stem, making a V shape about 1 inch up from bottom of leaf. Chop stems into 1/4-inch pieces. 2. Meanwhile, place quinoa and 2-1/4 cups broth in a medium saucepan. Bring to a boil, and stir once. Reduce heat; simmer (uncovered) until quinoa is tender and has absorbed all liquid, about 15 minutes. Transfer quinoa to a large bowl, keep in a warm place. 3. Heat a large sauté pan over medium-high; add butter and oil. When hot, add shallots and carrots; cook, stirring, until shallots are translucent, about 1 minute. 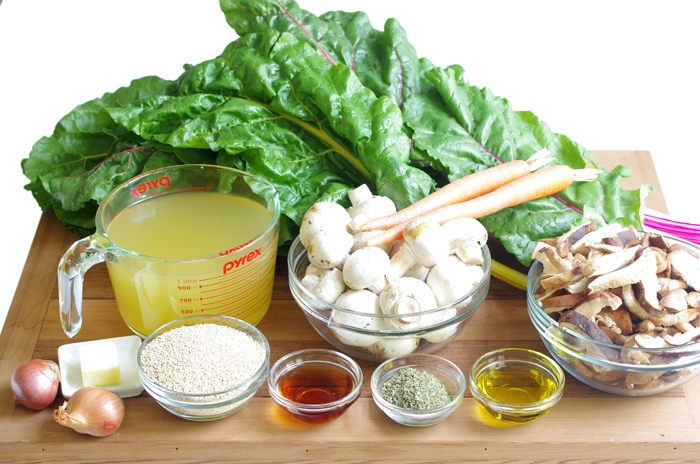 Add mushroom caps, chard stems, and 1/2 teaspoon salt; season with pepper. Sauté until vegetables are tender, stirring occasionally, about 8 minutes. 4. 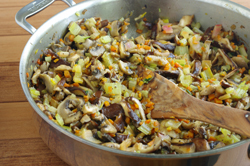 Remove 1-1/2 cups mushroom mixture from pan; add to quinoa. Reserve remaining mushroom mixture. Coarsely chop 1 tablespoon marjoram (or add 1/2 teaspoon dried); stir into quinoa. 5. Divide chard leaves into six portions. Form one portion into a 6-by-10-inch rectangle, overlapping leaves so there are no gaps. 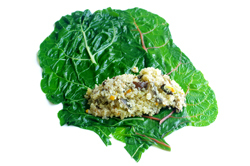 Place 1/2 cup quinoa mixture at a short end, then roll up a chard, enclosing sides. Brush lightly with oil; place in an 8-inch baking dish. Repeat, making 5 more rolls. Bake until heated through, 5 to 10 minutes. 6. Heat remaining mushroom mixture over medium-high. Add Marsala; cook, stirring, until most of the liquid has been absorbed. Add remaining 2 -3/4 cups broth; cook, stirring occasionally, until slightly thickened, about 6 minutes. Stir in remaining 1 tablespoon marjoram (or 1/ 2 teaspoon dried). 7. 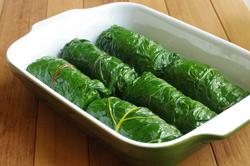 To serve, slice each chard roll in half; place in the center of a plate. Spoon the mushroom mixture around chard. Recipes from Power Foods from the Editors of Whole Living Magazine. Published Clarkson Potter/Publishers, New York, NY. Copyright 2010. Reprinted with permission of the publisher.